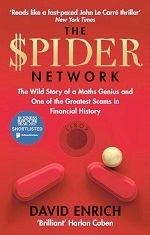 The sub-title for this is ‘The wild story of a maths genius and one of the greatest scams in financial history’ which, until a few years ago, would have been an astonishing once-in-a-lifetime event... but now seems curiously commonplace. No matter, the book itself – after much scene-setting of the over-the-top lifestyles of scruple-free traders – is a thriller on the Libor bank interest rate scandal where complicity rivals duplicity in earning top billing. Happily, though, at least one of those involved has a conscience. He still gets 14 years’ jail, though; he’s the fall guy.